NSA John Bolton says President Trump's statement that Israel will pay 'higher price' for embassy move doesn't indicate change in policy. US National Security Advisor John Bolton addressed journalists at a press conference in Jerusalem on Wednesday to discuss his visit to Israel, and US policy across the Middle East. The press conference opened Wednesday morning at the King David Hotel in Jerusalem, a day after Bolton met with Israeli President Reuven Rivlin, who accompanied him on a tour of the Yad Vashem World Holocaust Remembrance Center in the capital. Responding to a question from a reporter at the press conference regarding President Trump’s comments Tuesday night that Israel would have to pay a “higher price” in talks with the Palestinian Authority because of the US decision to relocate the embassy to Jerusalem, Bolton played down the statement, saying it did not indicate a change in US policy. “I don’t think there’s any change in policy. I think the president looked at the recognition of Jerusalem as being Israel’s capital and the inevitable consequence of that – that the US embassy ought to be in the capital city of the country which its accredited as the right and natural thing to do, and it’s not an issue of quid pro quo. “He’s made the point, I think, several times that this issue has been a hang up in negotiations between Israel and the Palestinians. And as he said last night as well, he’s taken that issue off the table. As a deal-maker... he would expect that the Palestinians would say, ‘Okay, great – we didn’t get that one, now we want something else.’ We’ll see how it goes. Bolton also criticized the Obama administration over its pursuit of the 2015 Iran nuclear deal, saying that the easing of sanctions on Tehran bolstered Iran's floundering economy, which had been in dire straits due to gross mismanagement. Rather than encourage Iran to moderate its behavior, Bolton continued, the new cash flow encouraged Tehran to increase its military activity across the Middle East and support for terrorism. "The Iran nuclear deal mitigated the effects of its mismanagement of the economy, and gave the regime new life... this regime that's been the central banker of terrorism since 1979... it gave it new assets for its nuclear weapons program, for its ballistic missile program, for its terrorist activities, for its conventional military activities." "We saw the consequences of the provision of these new resources in not reduced Iranian belligerency in the region after 2015, but increased Iranian belligerency." Turning to the planned framework for a final status agreement, dubbed the “Deal of the Century” by President Trump, Bolton appeared to reject reports suggesting the plan would be unveiled at the United Nations General Assembly next month. "On the peace plan, work continues. There are a lot of consultations that are underway, and there's no decision on when the timing of the full plan will be announced. I think there's been a lot of progress in relations in the region as a result of the process of going through the possible outlines of what the plan would look like. There have been dramatic geo-strategic changes in the Middle East with the recognition that the Iran deal has failed and failed badly. That gives the possibility of re-alignment with Israel and many of its Arab neighbors that no one would have predicted years before." "In terms of the specifics of when the plan might be rolled out, no decision as of now." On Tuesday, Bolton also visited the new US embassy in Jerusalem, formally part of the US consulate, where he was received by US Ambassador to Israel David M. Friedman. 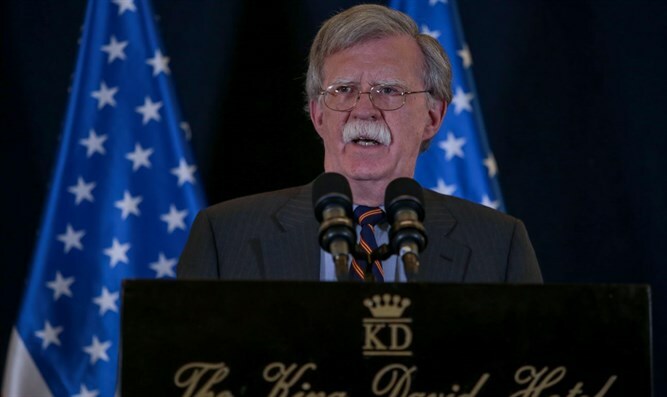 Bolton arrived in Israel Sunday night and met with Prime Minister Binyamin Netanyahu over dinner, the first of a series of meetings with the Israeli premier. On Monday, Bolton met against with Netanyahu, and addressed journalists at a joint press conference during which the two leaders bashed the “wretched” 2015 Joint Comprehensive Plan of Action, better known as the Iran nuclear deal, and vowed to work with European allies to encourage them to withdraw from the JCPOA. Iran’s nuclear program and Iranian efforts to promote terrorism across the Middle East and beyond were the primary focus of the Prime Minister’s talks with Bolton, Netanyahu said. Bolton’s visit was said to also address Syria and Iran’s military presence there as well as the future of the Gaza Strip.